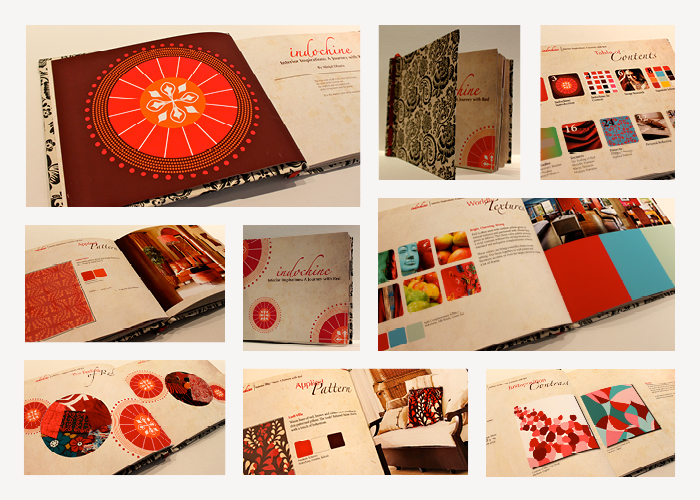 This handmade book is the end result of a semester-long intensive study of the color red in Color Workshop class. My study began with color research, which revealed many themes, among them, the significance of red in Eastern cultures. Choosing to work with this cultural theme, I developed a name for a signature hue of red – Indochine – and a brand logo inspired by the round shape of a mandala. I built a strategy for marketing Indochine in interior decor. By conducting fundamental color theory exercises digitally and using paint, I developed color palettes inspired by my chosen theme. Explorations of found objects and textures were used to design patterns that were applied to different home interior products.